I often find fragrance reviews the most difficult because it's so difficult to describe scents other than saying 'its nice' or 'I like it' which gives absolutely nothing away in terms of if you as the reader fancy buying it. 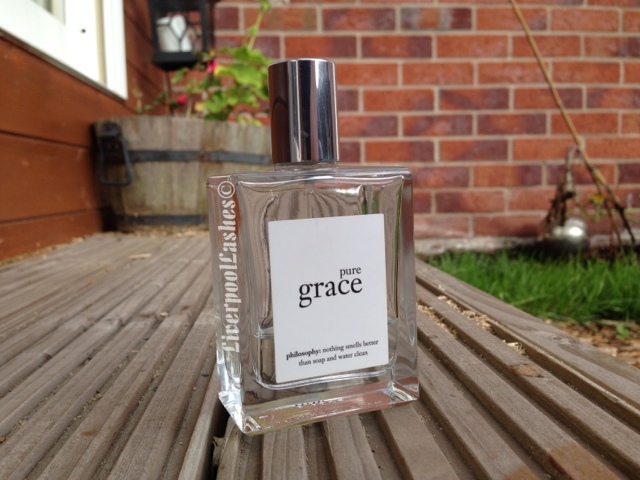 Thankfully the Philosophy Pure Grace Eau De Toilette is going to be a straight forward one that you will all know the scent of straight away. My husband bought me this perfume for Christmas last year. As I'm utterly ridiculous I don't mind admitting to you that I went into Boots with my friend searching for presents and sprayed all of the Philosophy testers on myself. I then decided I liked one of them but couldn't remember which one, when we went back there we couldn't match them up so I just told my husband I liked one of them. When Christmas Day arrived I opened up this bad boy and although I'm not sure if it's the original one I fell in love with, I do adore it just the same. My husband picked it for the name as 'Karen' means 'pure' - how cute is that?! Anyway I can describe this perfume in two words, clean linen. If you like the smell of clean linen and would like to smell like it then this is the one for you. I think for £32 for 60ml which I don't think is bad at all. See I told you this was a straight forward review didn't I?